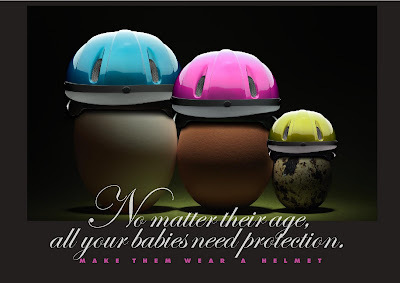 Motorbike Helmets for Kids in Vietnam? Not yet. A few years ago Vietnam finally passed a law requiring motorbike riders to wear a helmet but this law only required them for adult riders. Kids don't need them. Is somebody kidding somebody? We could blame the lawmakers for not seeing the fatalities and injuries amongst children but that shouldn't release parents from their basic responsibilities to protect those children should it? I didn't think so. 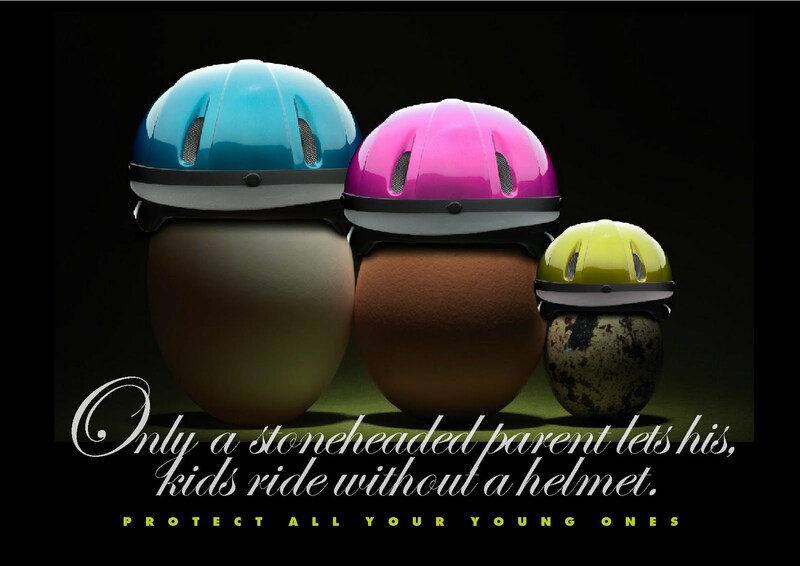 And so an idea was hatched (yeah, bad pun) to do a public service campaign to speak to parents about the importance of the whole family wearing a helmet. In a country of what might be easily, 30 million motorbikes for roughly 80 million people the motorbike is a way of life in Vietnam. In fact it's an extension of life, an extra limb it has been called. But it's also a way of death, the highest rate of highway fatalities in Asia before enactment of the law. On launch day, the government deployed 5000 police around the city (Saigon) to enforce strict fines ($10 is strict here) and lo and behold - one day nobody had a helmet and the next day they did. Except for the children. And this baffled the crap out of me. Didn't the people understand that a not fully formed skull can be crushed up to 60% easier than an adult's? Didn't they see it as important? And the answer is, 'no they didn't'. What was important to them was not paying a fine to comply with the law. Sad, I thought. 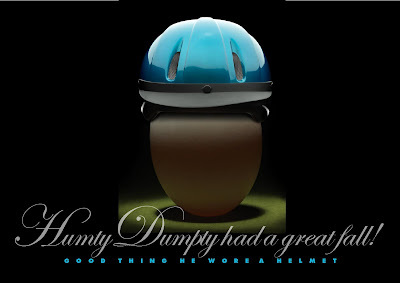 No thought about the reasons one should wear a helmet at all. Ask anyone what they believe to be a symbol of birth and childhood and you will eventually hear the word 'egg'. So I took that visual and put a helmet on it. It was funny. And it worked. 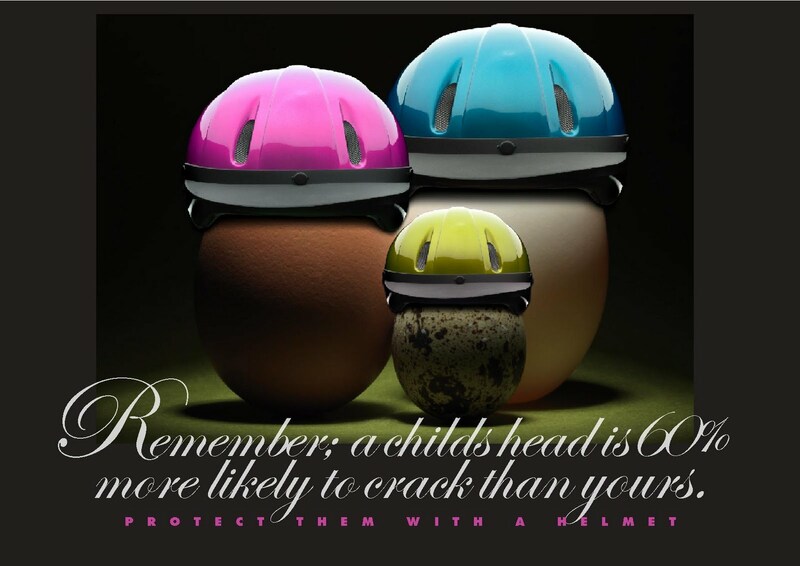 We all know eggs crack easily and putting a helmet on them just reinforced the point. Photographer Mads Monsen and I worked together to create this campaign and we did it without a specific client in mind - because we thought the idea was important. Should you know of any organization in Vietnam who might be interested in running this work as a public service, please contact me. We would love to get this campaign up and running and doing the job the parents should be doing - getting all their kids to wear a helmet. Can a beer be good design? From Adweek and Fast Company. 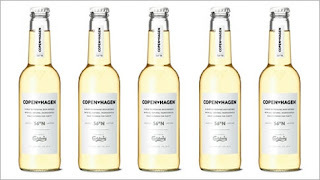 Danish brewer Carlsberg is getting set to unveil a new beer called Copenhagen, which is already turning heads for the minimal, stylish design of its bottles and other packaging. 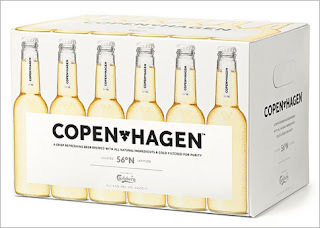 The message is unmistakable: In a category almost complete geared toward men, Copenhagen can also attract women, who make up one-quarter of the beer market. 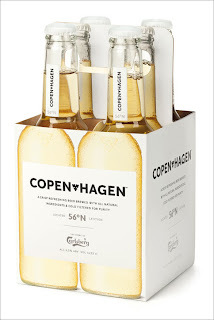 "We can see that there are a number of consumers, especially women, who are very aware of design when they choose beverage products," Jeanette Elgaard Carlsson, international innovation director at Carlsberg, says on the brewer's website. 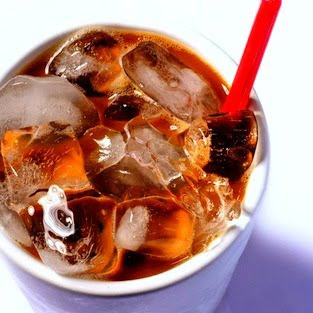 "There may be situations where they are standing in a bar and want their drinks to match their style. In this case, they may well reject a beer if the design does not appeal to them. The consumer surveys that we have conducted in Denmark show that 98% of the target group finds Copenhagen exciting." Of course, women presumably don't just choose a beer as a fashion accessory. But there isn't much mention of the taste, beyond it being "light" and "refreshing." 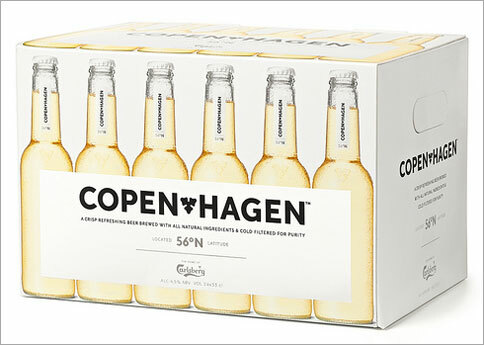 The brew hits the market in Denmark this year and the rest of Europe and parts of Asia next year. 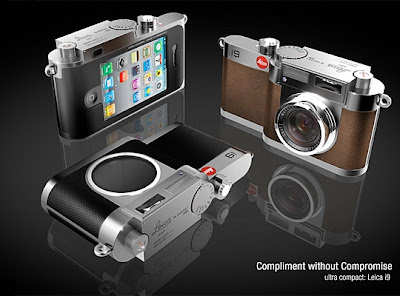 BLACK Design Associates have created this dream product concept, it's a collaboration match-made-in-heaven, digital camera heavyweights Leica teamed up the Leica i9 fixed-lens rangefinder camera with Apple’s iPhone 4. Combining the two products would result in a iPhone that connects up to a top-of-the-line digital camera, perhaps meaning the two would work together – the iPhone 4 screen as the digital camera screen, photos taken saved right to the iPhone? Let’s face it, this would be completely awesome. Leica, Apple, your move. Yo Yo Ma meets Lil Buck. You know Yo Yo Ma, he's the most famous cellist in the world. But you don't know Lil Buck - and that's what makes all of this work as well as it does. A fan of both on YouTube saw them independently and suggested a collaboration - certainly an element of audience participation gone viral. And this is now our media environment. Does life imitate art, or the other way around? There are now more ways than ever to explore that juxtaposition. What if more companies started to explore combining seemingly disparate elements? Could brands be reinvented, extended, reborn? Yes. Teachers, students and business people alike, should see the Propellers! A flurry of mail this week from teachers wishing they had seen and brought their students to Dinh Q. Le at aSaigon/CreativeMorning's last session but sadly, that time has passed - as will all Creative Mornings, so it makes only good sense to catch things as they happen. To that end, we are including the following flyer for posting at your school, company or otherwise place of business. We are intent on increasing the student population at events and are happy to fly in the face of other more commercial 'seminar' series that seek to charge you real money to see, too many times, just commercial people, trying to sell you something. At aSaigon/CreativeMorning, we have but one thing to sell you - new ideas. And we hope that will provide a kind of lasting value, quite seriously lacking in business today. Please download and post the following flyer for people who may not know us from the Internet. We have been pleased to have had many RMIT lecturers at events, but far fewer students. We hope aSCM to be an event for sharing information, so please teachers and others, share and share alike. Delloite, Raffles, Vietnam National, DDB, BBDO, WPP, Lowe and Navigos, join us as well. The Propeller Group is an art collaborative that specializes in media production, using popular culture, cinema, television, advertising, the web, galleries, museums, writings, interviews and conversation to distribute and disseminate art projects. The Propeller Group’s projects have been about collapsing media strategies of power, distribution, and access to information as well as issues of public vs. private space within the development of sub-cultures and popular cultures. "In many of our projects, we try to create disorder, hoping that disorder in such particular instances can become another "sense of order" to an audience that may be all too afraid of change, or unaccepting of other possible ways of engaging with their current cultural/social structures. We like to play. We align ourselves with different cultural producers. We like to let ourselves get ingested into the bellies of big social beasts such as television or the various manifestations of pop-culture. We feel that true criticality comes from the change that can happen from the inside of a system, and not from analytical discourse posited from external positions." The Propeller Group is comprised of Phunam Thuc Ha, Matt Lucero, and Tuan Andrew Nguyen. Based in Los Angeles and Ho Chi Minh City, The Propeller Group doesn't want you to view art in the way that one might have been taught to view art. And The Propeller Group doesn't want you to see television or any other medium for that matter for what you might believe it to be - rather they seek to be deconstructivist in any variety of media and have you put things back together in any way that you like. With the blurring of lines between television, telephones, computers and the next big mobile bling to hit the market, it only makes sense to begin to re-examine our relationship with media and recreate it for a new means of consumption. Come join us on April 15th as we explore disparate and ever changing creative horizons with The Propeller Group. aSaigon/CreativeMorning is a non-profit enterprise. All events are free of charge and the organizers do an amazing amount of work on a volunteer basis. aSaigon/CreativeMorning is a monthly speaker series that seeks to bring inspirational creative figures to breakfast with young creative minds in Vietnam for coffee, discourse and possibly a donut or two. Inspired by the CreativeMornings series in New York, Los Angeles, San Francisco and Zurich, originally founded by Tina Roth Eisenberg of SwissMiss Design Studio and Blog in New York, our group in Saigon is not associated with New York/CreativeMornings as of yet but is currently working with the Miss of Swiss to become an official chapter of CreativeMornings global.